Our Jacksonville Personal Injury Attorneys have represented hundreds of people that have been injured in both Jacksonville, Florida and throughout the state by no fault of their own. Our lawyers are available by appointment to meet with you at our Jacksonville office, your home, the hospital or at a location that is most convenient for you. In 95% of the Jacksonville, Florida accident cases that we handle our accident attorneys can tell you within a matter of minutes whether you have case. The best way to know if you have a case is to call us for a free phone consultation. Whether you are a Jacksonville resident or were injured in Jacksonville, our attorneys are available to discuss your recent accident. 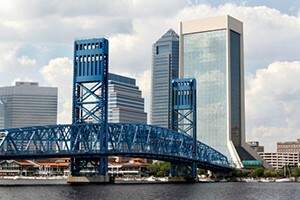 The city of Jacksonville, Florida is the largest city in the state in terms of population and in size. In fact, Jacksonville is the largest city in the US in area. It is the home to several large businesses, museums, theaters and shopping centers. Jacksonville has a large amount of commuters whom rely on the highways and roads to get to work and back daily. This large volume of drivers often causes slowdowns and traffic accidents on the busy roads. Of the over 800,000 residents, many rely on the crowded Interstate 10 and Interstate 95 to commute to work and back. Both interstates are frequently listed as the most dangerous highways in the US. Jacksonville is a large city, and yet, it is an accessible one. It has the largest municipal park system in the country with several large parks, such as Hemming Plaza and the Jacksonville Arboretum and Gardens. Within these parks, there is access to swimming, fishing, boating, bicycling and other outdoor activities. At times, these activities can be dangerous and accidents do occur. As such, there are many hospitals to serve the population, including Shands Jacksonville Medical Center and Memorial Jacksonville Hospital.